Brown marmorated stink bug nymphs (Halyomorpha halys) on ‘PrimeArk45’ primocane-fruiting blackberry fruit in September. Close up of the underside of the brown marmorated stink bug. Note the smooth "shoulders," banded antennae and the emerald-crusted prothorax. 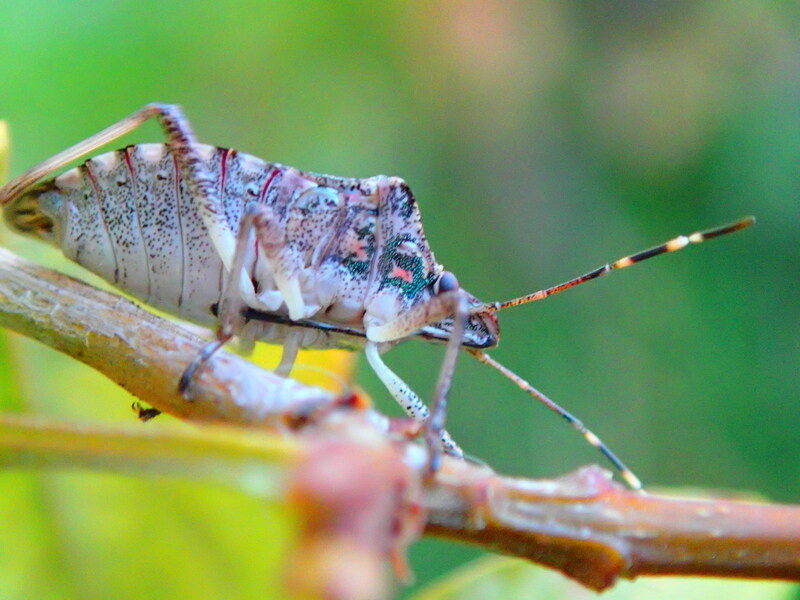 The brown marmorated stink bug (Halyomorpha halys) can be a very damaging invasive crop pest because it feeds on a wide-range of plants, has strong capacity for dispersal population increase, and until recently had no major natural enemies in the Pacific Northwest. It is also a nuisance pest when it damages gardens and overwinters inside houses in large numbers. 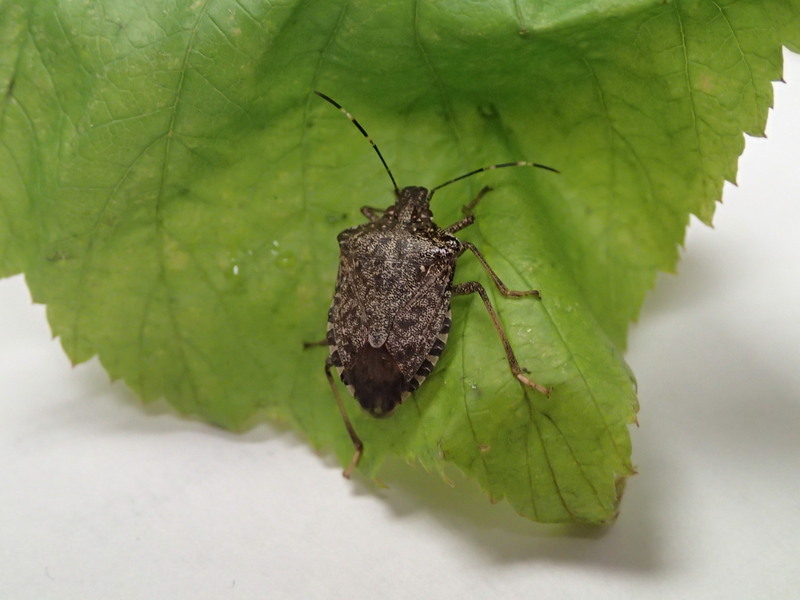 The brown marmorated stink bug (BMSB) was first observed in the United States in Allentown, Pennsylvania, in 1996, and is now found in most U.S. states, parts of Canada and Europe. It was discovered in Portland, Oregon in 2004, and in Vancouver, Washington in 2010. There may have been multiple introductions of the pest from Asia into the port of Portland. From Portland, BMSB spread south and is now common in all counties in the Willamette Valley. There has also been eastward spread of BMSB from Portland along the Columbia River, and populations are now established in Hood River and Wasco Counties. There have been detections in Gilliam, Jefferson, Lincoln, and Klamath Counties, and populations are established in Deschutes, Umatilla, Union, and Malheur Counties. In Southern Oregon, BMSB can be regarded as established in Douglas, Josephine and Jackson Counties. In Washington State, BMSB has become established in Benton, Chelan, Clark, Cowlitz, Douglas, Franklin, Klickitat, Lewis, Skamania, Thurston, Walla Walla, Whatcom, and Yakima Counties. BMSB can also be regarded as likely established in Spokane County. Populations of BMSB are also established in the Puget Sound region in Washington including: Snohomish, King, Pierce, Skagit, and Kitsap counties, and nuisance problems have been reported from the Seattle area. Agricultural problems from BMSB in the Pacific Northwest (PNW) region have been most evident in the northern Willamette Valley, Columbia Gorge, Walla Walla Valley and Rogue Valley. Commercial crops that have sustained damage from BMSB include hazelnuts, apples, pears, blueberries, and cherries. Nuisance problems can be severe anywhere BMSB is established. Nuisance problems encompass damage to noncommercial crops such as backyard fruit and vegetable gardens, aggregation on homes and other structures in the fall, and infestation of homes during winter. Nuisance problems are particularly severe in the greater Portland-Vancouver area and nearby communities. Adult BMSB (Hemiptera: Pentatomidae) are approximately 17 mm long, generally brown in color on the back, but coloration on the abdomen is variable, and can be gray, yellow, green, or red when viewed from below. The distinct white bands on the otherwise darkly colored antennae are a key character for identification. They also have alternating dark and light bands on the dorsal (top) part of the abdomen that protrudes out beyond the folded wings and dark bands on the tips of the membranous sections of the wings. Male BMSB are smaller than females and have a small notch in the distal end of their abdomen. BMSB look similar to two other genera of stink bugs common in the PNW, Euschistus spp. and the rough stink bug (Brochymena spp. ), but can be distinguished by a smooth anterior (forward) margin of the thorax (shoulder) while the other species have rough anterior margins on their thorax. The five immature stages of BMSB get larger and look more like the adult after each molt. The first instar is the smallest immature motile stage at about 2.4 mm in length. The fifth instar is approximately 12 mm in length. Immature BMSB have deep red eye color. Stink bugs have glands that emit a pungent aroma that resembles cilantro when they are disturbed or crushed. Adult BMSB overwinter in protected areas such as houses, outbuildings and outdoors in sheltered locations. When the weather warms up in the spring, BMSB exit their overwintering sites and disperse to vegetation to feed and reproduce. Adults and immatures readily attack fruit trees such as apple, pear, peach and cherry, particularly when fruit is present, but will also attack wine grapes, peppers, beans, and small fruits such as caneberry and blueberry. They have also caused economic damage to hazelnut (Corylus avellana) kernels in the Willamette Valley. Many ornamental species are important host plants, such as catalpa (Catalpa speciosa), tree-of-heaven (Ailanthus altissima), female English holly (Ilex aquifolium), various maples (Acer spp. ), lilac (Syringa spp. ), mountain ash (Sorbus aucuparia), and empress tree (Paulownia tomentosa). BMSB will feed on developing buds, fruit, trunks of thin-barked trees such as maple and peach, through ears of corn, pepper, tomato and a wide range of other plants. The eggs are laid in clusters ranging in number from 25-30 eggs per egg mass (28 on average), are typically blue-green and are attached to the underside of leaves. Eggs are most easily detected on broad-leaf hosts (e.g., Catalpa, Paulownia). After the eggs hatch, immature BMSB will molt five times as they mature into adults. Two generations per season can occur in Oregon. The BMSB, like other plant-feeding stink bugs, damages plants during feeding. All nymphal stages and adults can cause damage except for the first instar nymphs, which feed on the egg mass. Stink bugs feed by inserting their stylets into plant tissue, secreting digestive saliva, and then extracting the digested plant fluids. The extraction of plant fluids following the injection of the saliva results in deformed plant parts, loss of turgor and occasionally aborted plant ovaries. It is frequently observed that BMSB feeding on fruit and vegetables results in pithy, loose cell textured tissue surrounding the feeding site (corky tissue). BMSB feeding on apples close to harvest may not readily show apparent damage. However, damage is manifested during storage so that apparently undamaged fruit comes out of storage full of brown spots. Damage to fruits and nuts may not be apparent without cutting away the skin of the fruit or the nut. BMSB damage can be distinguished from plant physiological problems or nutrient deficiencies by the observation that pithy corking damage is always within 1 cm of the fruit surface. See https://catalog.extension.oregonstate.edu/em9054 for a printed BMSB identification guide with images of damage. During the summer and fall months, BMSB can be sampled several ways. The best ways are to just visually look for adults, nymphs, and egg masses on the crop or use beating trays or sweep nets to collect them from plants. Timed visual observations or other metrics of effort—such as the number of sweeps or beats—can help standardize samples. Pheromone traps are available commercially, but are marginally effective early in the season. Traps can be used as indicators of crop damage and, particularly early in the season, any captures of BMSB in the crop is reason for concern. Traps work best in the late summer and fall months in areas where BMSB are present. Interpretation of trap data is limited at this time as it is unclear how trap catch relates to density or damage potential in different crops. 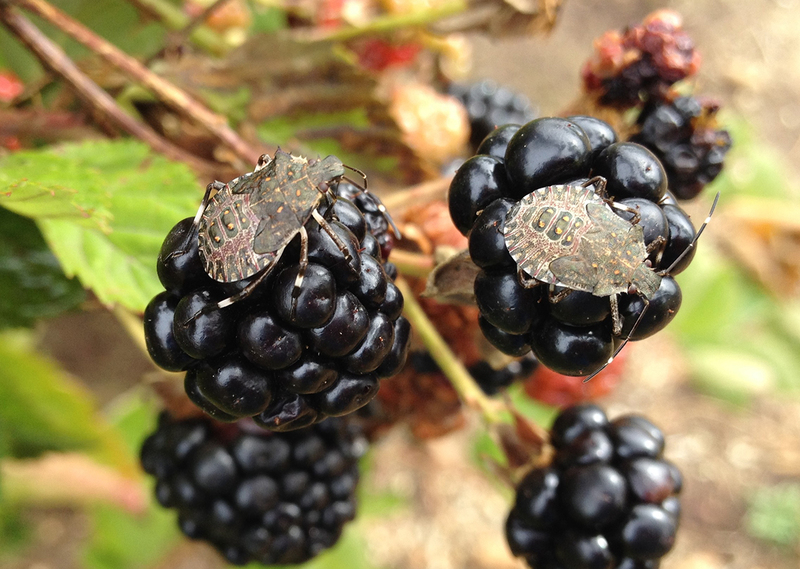 See “EM 9138: How to monitor for brown marmorated stink bug” https://catalog.extension.oregonstate.edu/em9138 for more information on sampling. There are limited established treatment thresholds for BMSB but given the severity of damage that occurs when populations are noticeable, growers readily spray insecticides. Current insecticide programs in the eastern USA are based upon pyrethroid, carbamate, organophosphate and neonicotinoid insecticides. All of these insecticides are disruptive to various natural enemies and have the potential to cause secondary pest outbreaks. Gardeners and growers with small plots may be able to exclude BMSB with fine netting, but this approach is not feasible for larger farms. Biological control of BMSB was initiated with the adventive arrival of samurai wasp (Trissolcus japonicus) to the PNW. This parasioid wasp attacks and parasitizes BMSB eggs and has a parasitism rate of approximately 60-70% of BMSB egg masses in its native range of China. Wild populations of the wasp were first recorded in Vancouver WA in 2015, and in Portland OR in 2016, and in Beaverton OR and Walla Walla WA in 2017. Recently, samurai wasps were released in urban areas and orchard perimeters in the Columbia Gorge and in the Willamette, Rogue, and Walla Walla valleys. As of 2018, wasps were found for two or more consecutive years at 23 sites. Most of these locations are in the Portland metropolitan area, and other locations include Monmouth, the Walla Walla Valley (OR and WA sides), The Dalles, Hermiston, Hood River, and Mulino. Urban or riparian areas appear to be the ideal habitats for samurai wasp establishment.. As the current range of samurai wasp continues to expand through both assisted and unassisted means, it is expected that samurai wasp could reduce BMSB populations locally. Several northeastern and mid-Atlantic states also have wild samurai wasp populations. Adults are 1.5 mm, black, prefer shaded areas, and have been spotted on BMSB egg masses laid on ornamental trees including maple, hawthorn (Crataegus spp. ), and boxelder. Although the wasp’s small size makes it difficult to detect, several signs indicate the presence of samurai wasp or other parasitoids. Wasps can be recognized by their “guarding behavior” – walking and laying eggs on BMSB egg masses. Parasitized egg masses will turn a dark black color 3-5 days after being attacked. After parasitoid emergence, eggs have uneven circular holes. For further detail on recognizing parasitized egg masses, see EM 9164 (below). Generalist arthropod predators can also feed on BMSB egg masses. A predatory wasp, Astata, attacks late instar nymphs and brings them to a nest in the soil, but minimal information is known about its distribution beyond the Portland metro area. This pest will overwinter in homes. During the fall, BMSB aggregate on sides of houses and buildings. They then work their way into the buildings through cracks and other openings. They can be in a semi-dormant state during most of the winter, but warm spells cause them to move around and become more noticeable. The best way to prevent them from entering homes is to seal all the openings with caulking or other material to exclude them. Once in the house, vacuuming them is the best way to capture and remove BMSB. Crushing them can cause them to release their defensive aroma, which is disagreeable and lingers for a time.